The Brandywine River Museum of Art has big plans for 2017, with two blockbuster exhibitions and a full slate of the museum's traditional events. The new season kicks off on Feb. 25 with “From Homer to Hopper: Experiment and Ingenuity in American Art.” The exhibition, which continues through May 21, reflects the rich diversity of style and expression in American art created between 1870 and 1950. Edward Hopper (1882-1967) 'Sunday,' 1926. Oil on canvas, 29 x 34 in. The Phillips Collection, Washington, D.C. The Phillips Collection, founded in 1918 by Duncan Phillips and opened in the Phillips family home in 1921, was dedicated to modernism and to America’s best artists. Phillips formed his groundbreaking collection with an emphasis on paintings by artists whose critical thinking and creative originality would raise American art out of obscurity. He challenged the perceived superiority of European over American art. In addition, he sought works by women, artists of color, and native and foreign-born or self-taught artists, so that the collection represented a “fusion of various sensitivities” and a “unification of differences” that would parallel the multicultural character of the nation. 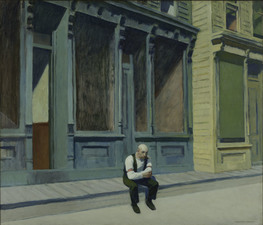 Assembled by the Phillips Collection in Washington, D.C., it features 54 paintings by Stuart Davis, Arthur Dove, Thomas Eakins, Marsden Hartley, Childe Hassam, Winslow Homer, Edward Hopper, Jacob Lawrence, Georgia O’Keeffe, Horace Pippin, Maurice Prendergast, John Sloan, and many others. The show traces the course of modern art in the works of these artists – from the bold, investigative realism of Winslow Homer and Thomas Eakins at the end of the 19th century,to the reductive views and psychological insights of Edward Hopper and Morris Graves at mid-20th century. The season's other major exhibition will be “Andrew Wyeth: In Retrospect,” opening on June 24 and continuing through Sept. 17. To mark the 100th anniversary of Wyeth’s birth, the Brandywine and the Seattle Art Museum are presenting an exhibition of more than 100 of his finest paintings and works on paper selected from major museums and private collections. Wyeth's career arc will also be explored, noting the critical responses to his work, as well as his immense public success. New interpretations will be offered on the significance of outside influences on his work -- such as film and war -- and on the subjects and themes that occupied him throughout his career. The exhibition will be the first in-depth, chronological examination of Wyeth’s career since 1973. 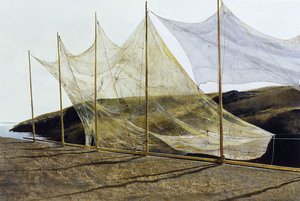 Co-curated by Audrey Lewis (curator at the Brandywine River Museum of Art) and Patricia Junker (the Ann M. Barwick curator of American art at the Seattle Art Museum), “In Retrospect” will explore how the artist’s work evolved over the decades and will connect him more fully to traditions in American and European art. The exhibition will bring together both well-known and rarely seen works created between the mid-1930s and Wyeth’s death in 2009 that reveal the subjects that continually inspired him. Organized chronologically, the exhibition will examine Wyeth’s unrelenting realism in the context of the 20th century, looking at how outside forces shaped his choice of subjects, and his approach to portraying the people, places and things that reflect the internal musings of a complicated man. The exhibition will reveal how Wyeth continually pared down his subject matter, distilling the essence of character hidden beneath the surface of his subjects. This exhibition will open at the Brandywine River Museum of Art, followed by its presentation at the Seattle Art Museum beginning in October 2017. It will be accompanied by a catalogue published by Yale University Press. The catalogue will offer significant firsts in Wyeth studies: It will lay out the first detailed timeline of Wyeth’s full career; it will present the first contextual examination of the career, decade by decade; and it will offer new, in-depth analysis of key aspects of his work by both young and established Wyeth scholars from the U.S. and Japan. The catalogue is intended to be a foundation for subsequent Wyeth studies. Museum hours are 9:30 a.m. to 4:30 p.m. For more information, call 610-388-2700 or visit www.brandywinemuseum.org.